Visitors to the Nevada State Railroad Museum in Carson City are often puzzled by the name—Wabuska—on the yellow depot sitting near the front of the facility. While it may sound like some kind of sausage, once upon a time there was a town called Wabuska, which was an important junction for the Carson & Colorado (and later Southern Pacific) Railroad. The depot is one of the few reminders of this town with the unusual name. 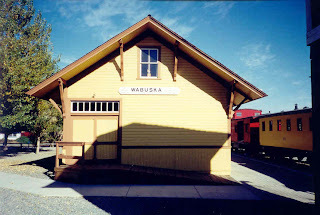 In the 1980s, so little remained of Wabuska that its depot was moved to the museum and restored. The town experienced a bit of a boom in 1881 when it became the location of a Carson & Colorado Railroad station. Along with gaining a railroad, the town saw construction of a small general store and hotel, where rail workers could take meals. The station was built by railroad agent Edward Lovejoy, who perhaps more than anyone who ever lived in Wabuska, earns the town a place in Nevada history. Lovejoy was the only son of one of the 19th century’s most famous abolitionists, Elijah P. Lovejoy, who was the first white person to die for the anti-slavery cause. Additionally, the younger Lovejoy was a friend of Sam Davis, colorful editor of the Carson Appeal. Davis created a fictitious newspaper, the Wabuska Mangler, and named Lovejoy as its editor. From 1889 until Lovejoy’s death in 1891, Davis frequently poked fun at his friend in print, quoting from fictional editorials allegedly written by Lovejoy and concocting a feud between the two newspapers. Wabuska’s high point occurred after 1900, when the Carson & Colorado was absorbed by the Southern Pacific Railroad and the town became an essential junction for central and southern Nevada mining camps. In 1911, the Nevada Copper Belt Railroad was completed, connecting the railroad line at Wabuska to several new copper mines near Yerington. For the next few years, Wabuska boomed and soon had a large railroad station, a school, grocery stores, saloons and nearly 60 families. Additionally, the town benefited from the construction of two large copper smelters at Thompson, located only a few miles north. Ore processed at Thompson was transported through Wabuska. The copper industry slumped in the early 1920s and Wabuska began to shrink. By the 1950s, the town consisted of a half dozen houses and a two-story grocery store and bar. Today, while the train still passes through the area, Wabuska has nearly disappeared. Wandering the former site of Wabuska, you can see how the place earned its name. The soil is layered with a white alkaline crust and there are thickets of yellow-brown sagebrush and greasewood. Behind the grocery store, just beyond a decaying truck, are the ruins of three or four homes. One appears to have at least partially burned down while the others seem to be victims of abandonment and neglect. Pushing through the thick underbrush, you can find a few brick walls, concrete foundations, old stoves, nails, wood scraps, wires and the other remnants of civilization. A partially collapsed barn—now little more than a frail skeleton of warped, worn boards and chicken wire—peeks out of the sagebrush, behind one of the more intact houses. In a few places, beware of what appear to be outhouse, septic tank or well openings, where the wooden coverings have rotted away, leaving only holes. Wabuska has become another Nevada shadow town—still more than a memory but less than what it was once. The site of Wabuska is located about 40 miles southwest of Fallon via U.S. 50 and Alternate U.S. 95. The nearest town is Yerington, located 11 miles south.